Would you make a good periodontist? Take our career test to find out how you match with this and over 800 other careers. What is the workplace of a Periodontist like? A periodontist is a dentist who is an expert in the treatment of oral inflammation, and who knows how to prevent, diagnose, and treat periodontal disease. Periodontists receive extensive training in these areas, and are familiar with the latest techniques for diagnosing and treating periodontal disease. Some periodontal needs can be managed by a general dentist, however, more and more patients are showing signs of periodontal disease. 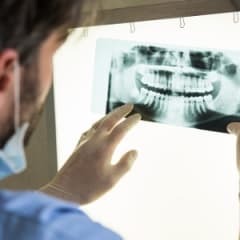 Research also suggests a link between periodontal disease and other chronic diseases of aging, therefore there may be a need for periodontal treatment that has an increased level of expertise by a trained specialist. Patients who have moderate or severe levels of periodontal disease can be managed by a partnership between their dentist and a periodontist. Periodontists treat cases that are more problematic, such as those with severe gum disease or with a complicated medical history. Treatments include scaling and root planing (in which the infected surface of the root is cleaned) or root surface debridement (in which damaged tissue is removed). Periodontists also treat patients with severe gum problems using a range of surgical procedures. In addition, they are specially trained in the placement, maintenance, and repair of dental implants. During the first visit, the periodontist typically reviews the patient’s complete medical and dental histories. It is extremely important for the periodontist to know if any medications are being taken or if the patient is being treated for any condition that can affect periodontal care, such as heart disease, diabetes, or pregnancy. The periodontist will then examine the gums, check to see if there is any gum line recession, assess how the teeth fit together when biting, and will check the teeth to see if any are loose. The periodontist will also take a small measuring instrument (called a probe) and place it between the teeth and gums to determine the depth of those spaces, known as periodontal pockets. This helps the periodontist assess the health of the gums. X-rays may also be taken to observe the health of the bone below the gum line. Periodontists have distinct personalities. Think you might match up? Take the free career test to find out if becoming a periodontist is right for you. Dentists and periodontists work in similar settings, such as solo practices, group practices, hospitals, dental schools and other health clinics. In some cases, dentists and periodontists will work in the same clinic, allowing them to collaborate to treat patients. These clinics may include other dental specialists, such as orthodontists.